In March 2015, a LIDAR satellite scan was made of the Bosnian Valley of the Pyramids in the Visoko, Bosnia area. LIDAR (“light-radar”) scans provide a detailed topographical picture of the area scanned. The first LIDAR scan image of the Visoko area, finally available as of July 6, 2016, shows clear evidence of gargantuan ancient artificial structures. The visibly predominant features of these ancient structures are smooth pyramidal, and other, faces oriented to the cosmic north (or “true north” or “geodetic north”). Astonishingly, the Bosnian Pyramid of the Sun has the best-documented orientation to the cosmic north of any pyramid on the planet thus far analyzed. Thus, the orientation of the Bosnian Pyramid of the Sun to cosmic north is 12.33 times more precise than the orientation of the Great Pyramid. The north face of the Bosnian Pyramid of the Sun, the tallest documented pyramid in the world, in Visoko, Bosnia. On the left side of the pyramid (and joining it structurally) is the Bosnian Pyramid of Love. Bosnian Pyramids detractors are now in a very difficult position. For 10 years, various persons and organizations relying on belief instead of science have 1) disparaged (and, even more shockingly) 2) ignored copious scientific evidence of an ancient pyramid complex centered in Visoko, Bosnia. Because a 2015 LIDAR scan data has provided solid — indeed irrefutable — evidence of gargantuan and truly ancient structures in Visoko, Bosnia, the final nail has been hammered into the coffin of Bosnian Pyramids detractors. Who were the main players in this strange 10-year drama of Belief vs. Science? A claim of fraud is very big news in the archaeological world. Obviously, if such a claim is found to be false – that is, if the claim is found to be libel (a false accusation made in print) or slander (a false accusation made in speech or some other transitory form) – it is legally actionable. Since pyramids have indeed existed in Bosnia since ancient times, and since volunteers and employees of Archaeological Park Foundation have been faithfully excavating these structures, and NOT creating modern-day step–pyramids, Dr. Schoch is in fact on record for ten years of libel. Not only has Dr. Schoch been wrong for ten years about the existence of pyramids in Bosnia, he has left a libelous and slanderous legacy the likes of which has rarely been seen in archaeological circles. Zahi Hawass, Former Minister of Egyptian Antiquities, was one of the first professionals to proclaim (without compelling evidence and without visiting the site) that no pyramids exist in Bosnia. Hawass has since been discredited — and is actually on the run — for allegedly stealing billions of dollars worth of Egyptian antiquities and possibly other crimes. What was Hawass’s reaction when he heard of Dr. Omanagich’s claim that pyramids existed in Bosnia? He called a meeting of Egyptian officials to discuss possible negative ramifications to the Egyptian tourist industry. From the point of view of scientists and others endeavoring to discover the truth about humanity’s past, the absurdity of such a reaction — “How will our tourist dollars be affected if pyramids are found in Bosnia?” — is almost impossible to put into words. In fact, a study of ten years of Archaeology magazine articles allows us to conclude that Archaeology magazine editors, specifically Editor-in-Chief Claudia Valentino and Executive Editor Jarrett A. Lobell, perhaps at the behest of unknown persons, have attempted (and failed) to keep the lid on the biggest archaeological discovery of the 21st century: the discovery of gargantuan ancient pyramids and other structures in Bosnia. It cannot be asserted that Archaeology magazine editors were not aware of the continuous stream of scientific information emerging from the excavation and study of Bosnian Pyramid Complex since mid-2005. On October 16, 2011, I emailed a detailed a letter to the Editor of Archaeology, the full text of which is here (in a blog titled, “Letter to the Editor of Archaeology Magazine“). Did you know that a giant stone sphere (the largest ever found) was discovered in 2015 near Zavidovici, Bosnia in Dr. Osmanagich’s Stone Spheres Park (or Stone Balls Park)? You wouldn’t know this fact if Archaeology magazine were your only source for information about archaeological finds on planet Earth. Fortunately, Russia Today made quite a big deal of the discovery. They sent their own people out to Zavidovici and made a video. Could there be some ideological (or other) agenda at Archaeology magazine that we’re not aware of? If so, what is this anti-scientific agenda, and who is responsible for it? I submitted the article to Wikipedia editors on January 29, 2015, but it was immediately rejected. Oddly, Wikipedia editors did not read the article or check the hyperlinks in the article. A full reading of the article and a full researching of the articles and videos pointed to by the hyperlinks would have taken a week, at minimum. I edited the article and re-submitted it twice, but it was immediately rejected both times without any of the issues I brought up being addressed by any of the Wikipedia editors who “weighed in” (sent form letters to me) on the article. All attempts at rectifying the egregious misstatements on these two Wikipedia pages have failed. Now that the world has been offered conclusive — indeed, irrefutable — evidence of gigantic ancient pyramidal and other structures in the Visoko, Bosnia area (in addition to copious additional scientific evidence gathered over the period of 10+ years by Dr. Sam Osmanagich and scores of scientists and thousands of eager international volunteers working on the most active archaeological project in the world) . . .
1. Will Dr. Robert Milton Schoch return to the Bosnian Valley of the Pyramids to witness what 10 years of excavation has accomplished since his initial and only visit in 2006? Will Dr. Schoch retract his unwarranted and outrageous libel (and slander) of Dr. Osmanagich and Archaeological Park Foundation employees and volunteers? 2. Will Zahi Hawass publicly acknowledge the artificial structural stone terraces on the Bosnian Pyramid of the Moon and the four layers of super-dense concrete on the Bosnian Pyramid of the Sun (the hardest concrete ever analyzed, ancient or modern), and the ceramic megaliths, impossible to move by any known machinery, that lie next to newly excavated corridors in Ravne Tunnel Labyrinth, which winds for tens of kilometers beneath the Bosnian Pyramid Complex? 3. Will Archaeology magazine editors apologize to the scientific and world community for their 10-year moratorium on Bosnian archaeology? 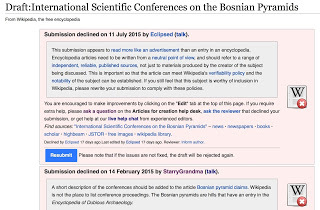 Will Archaeology once again begin to publish Bosnian archaeology articles? Will the entire staff of Archaeology apologize for committing perhaps the greatest hoax in archaeological history: the denial and ridicule of the discovery of the biggest ancient pyramids in the world? 4. Will Wikipedia editors apologize for ignoring plain science for ten years and for libeling and demonizing Dr. Osmanagich? Will Wikipedia editors publish articles on Bosnian Pyramid science and the copious scientific conferences that have been held in Visoko and Sarajevo, Bosnia? Will the Bosnian Pyramids mega-discovery be recognized and honored by Wikipedia as perhaps the greatest archaeological discovery of this century? Will Wikipedia editors allow real science to enter the hallowed halls of its heavily controlled pages on ancient history, or will the truth about humanity’s past continue to be suppressed? In short, will the future be 1) a scientific future that recognizes scientific evidence or 2) an anti-scientific future that scorns it? It is the archaeological (and anthropological) orthodoxy’s move. A conspiracy of ridicule against the Bosnian Pyramids Project — a conspiracy that spanned 2005 and 2006 — turned into a conspiracy of silence after it became clear that Dr. Osmanagich had indeed unveiled a great mystery in Europe. The conspiracy of silence continues to this day. Will the conspiracy end? Will it end with a cowardly whimper or with a courageous bang?